Brent takes a plunge (several times)! The Faculty of Applied Science and Engineering held their Plunge a Prof fundraising event yesterday. The weather was perfect for those looking to dunk their department leaders and from the looks on people’s faces, everyone had a great time! 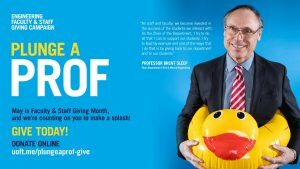 Professor Brent Sleep, Chair of Civil & Mineral Engineering, graciously volunteered himself to be dunked in exchange for staff and faculty donations to the University. Many took him up on this and then some, dunking him several (8) times, in some chilly water, over the course of 20 minutes. Students and passersby were engaged and applauded and cheered every time a professor was dunked. This event serves to highlight the importance of giving, by all members of the University community. By making donations, staff and faculty set a great example for alumni to follow, and show they really care about the University. I support the department to enhance the experience of all of our students. Our student clubs plan events, run student programming and contribute to the extra-curricular aspects of the department, and as much as we’d like to fund all initiatives, there isn’t always room in the budget to do so. I believe there is a lot of value in enriching the student experience beyond the classroom. So when the department receives donations, it means that we are able to fund more scholarships, host events like career panels and networking evenings, and provide more opportunities for students to attend conferences and competitions (such as the Concrete Canoe, Mining Games and TargetZero). Thanks to all those in the Department and Faculty who showed their support!